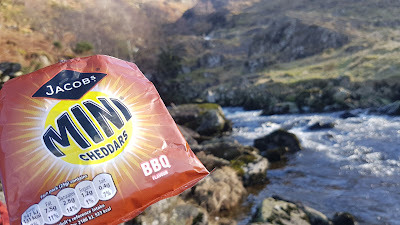 I adore crisps but they are really not practical on a hike - they are far too fragile and end up as a disappointing pile of smashed up crispy dust, impossible to eat on a windy hillside. Cheddars, on the other hand, come in smaller packs, are more robustly constructed and aren't so easily blown out of your hand in a force nine gale. 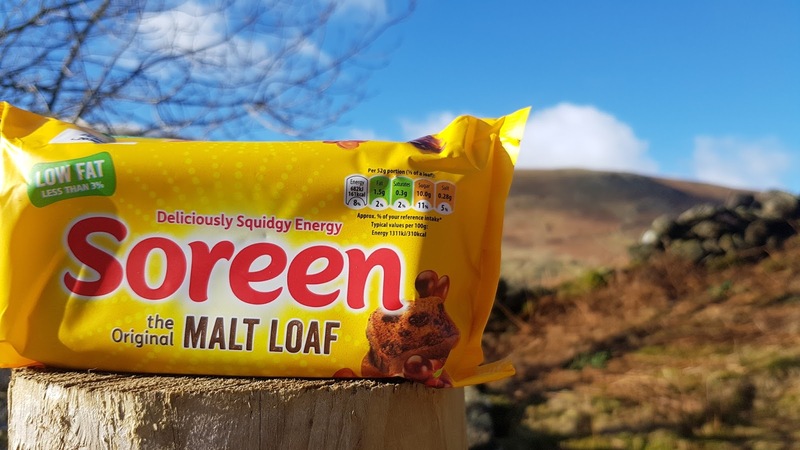 I have extolled the virtues of the humble malt loaf many times in the past. For me it is a near perfect hiking food. 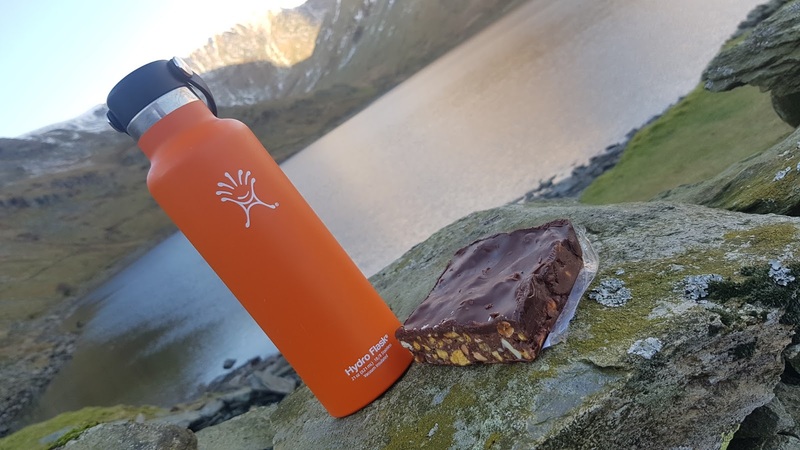 It's solid, doesn't melt, can be shoved in a corner of the rucksack and is crammed full of calories for that much needed boost when you're flagging at the end of the day. At home we may slice it and serve it in a civilised fashion, on the hillside we simply rip chunks off it and argue over who has the biggest chunk. If you're on a health kick you could always swap these for a nice bag of dried fruit and nuts but we found that the bags of fruit and nut returned unharmed from far more hikes than the peanut M&Ms did and often got dangerously near to their expiry date before we ate them. M&Ms do have their downsides - being chocolate they're not great in the summer but, let's face it, there aren't going to be many days when you're hiking in Cumbria in 30C temperatures. 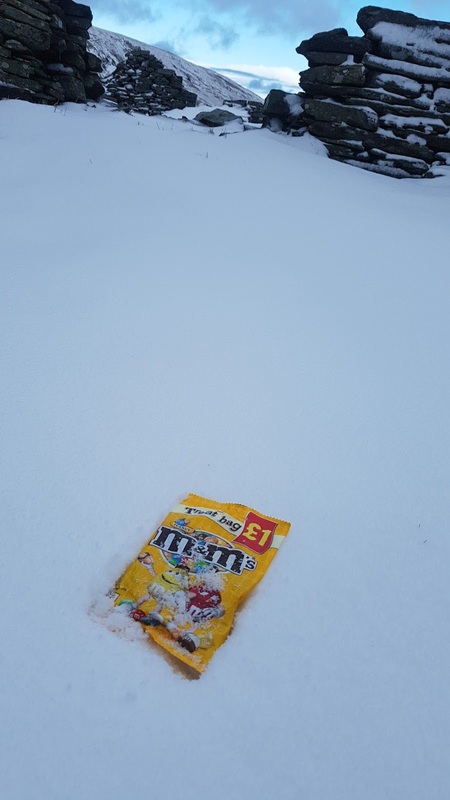 Nutritionally you get a double benefit from peanut M&Ms - a quick sugar boost from the chocolate and a slower boost from the nuts. It's tenuous, but it's what I keep telling myself. 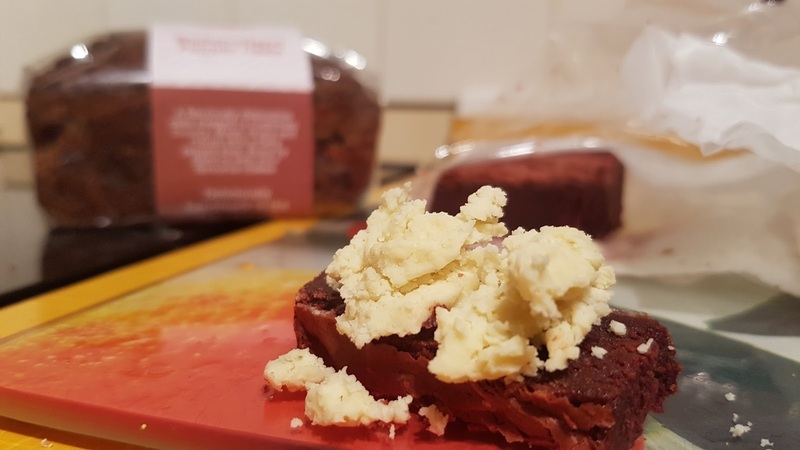 White Stilton on Beetroot & Berry Brownie - don't knock it till you've tried it! (The blurry cake in the background is their new Westmorland Pepper Fruitcake which is perfect when sliced thickly and spread with butter). 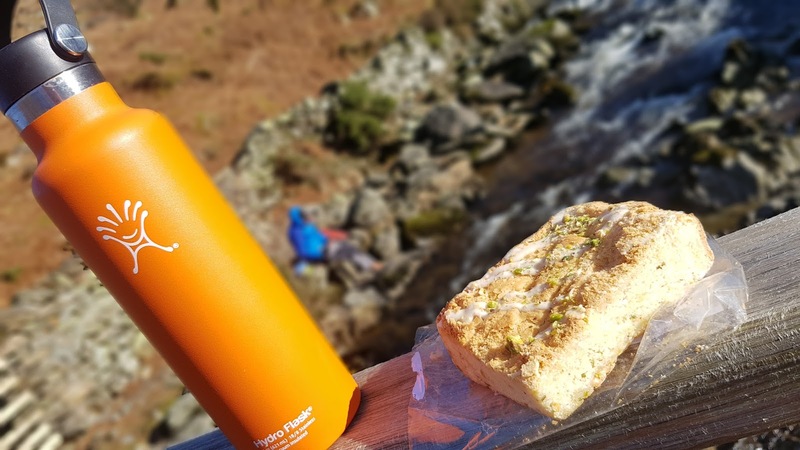 The best part is that you don't even need to come to Kendal to buy them - they have an online shop right here so you can enjoy them wherever your hike may take you. 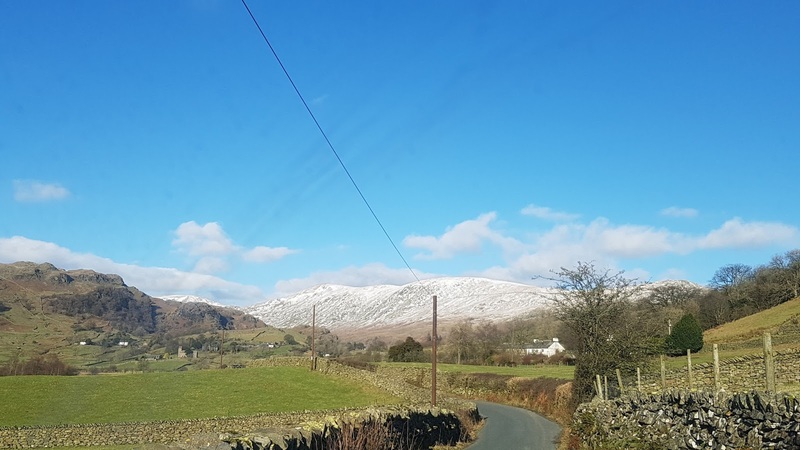 So, that's our top 5 - I know there will be others you want to add - but please don't tell me to pack Kendal Mintcake, I know I live in Cumbria but I honestly can't stand it. Sorry. "The nights are drawing out, not long till spring now" - I've seen this several times across social media already this past week or so and it's not that I won't enjoy spring when it gets here, it's just that I'm not desperate for it to arrive. 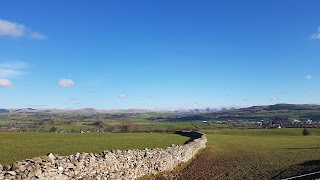 These days we seem far too eager to wish our lives away: "I can't wait for summer", "I'll be able to ditch my big coat soon" and "I'm fed up of all the long dark nights" - and yet when summer does arrive it's invariably either too hot, too cold, too wet or too dry and "maybe it will be better tomorrow/ next week/ next year". Those who know me will tell you that I am definitely not a creature of habit, repeated routines drive me nuts and I thrive on unpredictability, but I do have one routine. Every Friday night, without fail, it's chippy tea night. I adore my Friday night bag of fishy chippy goodness and really miss it when we're away from home, in the wilds of nowhere, without a chip shop in sight. The thing is it scares me how quickly chippy tea night comes around each week; "Friday? Already? Where did the week go?" - like a malfunctioning lighthouse whose beam sweeps faster and faster - I sometimes feel that my life is racing away one large cod and chips at a time. The way I see it, there's no point in being upset at either the weather or the season - I don't have control over either of those things, so I may as well enjoy wherever we are now and figure out a way to make the most of it. 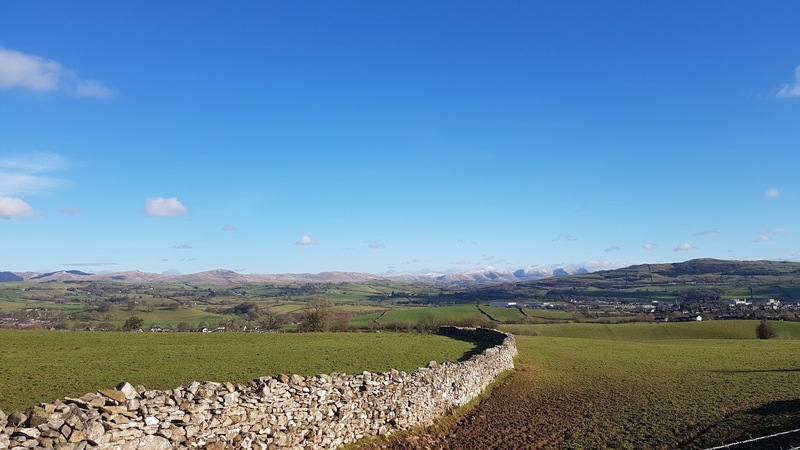 Take this past week for example; we've enjoyed glorious walks in the sunshine and we've huddled up indoors while it slings it down outside, tossing logs on the fire as the house fills with the smell of jacket spuds and we pore over maps planning the pitch for our next book. Maybe it's my age (I turned 50 last year) or the fact that I spend a lot of time reading about history, but I find that time flies by fast enough as it is without me wishing it away. "Where did last year go? ", "It only seems like 5 minutes since the millennium", "Is Simon Le Bon really 60 this year?" Spring is on its way; it will get here in its own sweet time and I promise I will enjoy it down to the very last bluebell, but I'm not going to wish my life away waiting for it to arrive.